Japanese Chin is a dog of Japanese Royalty and in the past could only be owned by the Japanese Imperial family members. They became immensely popular in 1853 when a pair of Japanese Chin, then known as Japanese Spaniel, was gifted to Queen Victoria. In 1964 they became the national symbol of Japan and in 1977 their name was changed from Japanese Spaniel to Japanese Chin by AKC. Japanese Chin is very rare in the United States but in Japan they remain precious. Japanese Chins are a delicate breed with a square body and have fine bones. They appear to be Oriental with an inquisitive expression. They were bred in order to be pampered and loved and it is continued even today. It is a very brainy, affectionate, pleasing, decent, courageous, devoted and a joyful breed who can easily imitate the moods of people around them. They are apt for homes with older children because of their soft and sensitive nature and easily get along with other pets and dogs. They are excellent as guard dogs even though they do not bark in excess. Along with being attention seekers, they have an extraordinarily mind and will never forget a companion or an enemy, and has fixed likes and dislikes. Japanese Chin is unmatched to keep as a family pet. Grooming of this dog is difficult as it needs to be combed and brushed every day in order to ensure a tangle free coat. Moreover, the combing and brushing has to be done is a certain manner and thus a lesson from a professional dog groomer has to be taken. Moreover, their ears and eyes need to be cleaned and checked everyday. They have a dense, straight and soft coat with fur being denser around the neck and chest. 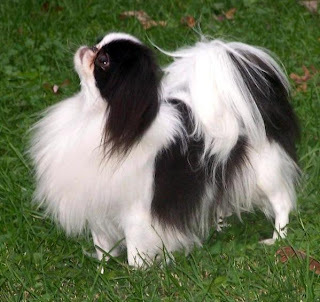 As compare to other toy breeds, Japanese Chin is more respectful and love to please their owners because of which the training is a very easy task. This breed learns and performs tricks very easily. Japanese Chins are sensitive because of which soft, affectionate, just and continuous methods of training must be adopted. Harsh training methods should never be adopted. They need a little amount of exercise and adore short walks or play routine on a daily basis. They are apt for apartment living but will be at an advantage if given the chance to play in a small fenced ground. However, it must be kept in mind that Japanese Chins are very sensitive to temperature extremes.